Our 3d printed SLS plastic Star Trek TOS communicator -cool right?! 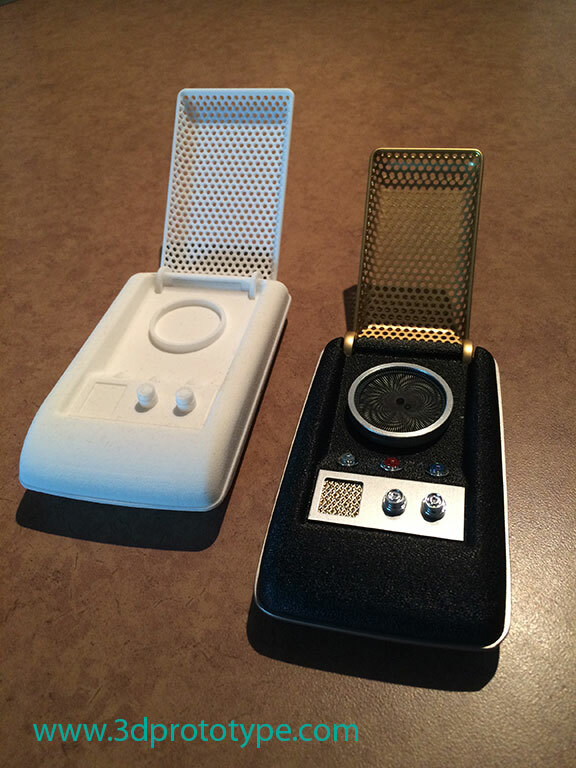 - 3D Prototype Design, Inc.
Home/Uncategorized/Our 3d printed SLS plastic Star Trek TOS communicator -cool right?! Working at a 3d printing company certainly has its privileges! In 2016 I pre-ordered a Star Trek TOS bluetooth communicator as a gift for my husband. Instead of yet again wrapping a piece of paper with a promise, one or our techs got to work and did me a big favour not to mention an amazing job! In fact, it was our understanding that the delay in release of the bluetooth replica was due to an issue in the door functioning, which he fixed in his drawing! I emailed the company at the time to let them know about our 3d printing services as they would have come in real handy, saved them a lot of time, money and disappointed Star Trek fans who waited an additional 6 months before their item shipped!